Nature’s Way Pest Control is a family owned and operated business providing pest control, mold removal, and attic insulation services in the regions of upstate New York and Vermont. Facing a sea of competition, Nature’s Way wasn’t getting found online when residents and business owners in the area searched for nearby pest control companies. Inquiries were slowing down as local and national competitors began invading the search results. 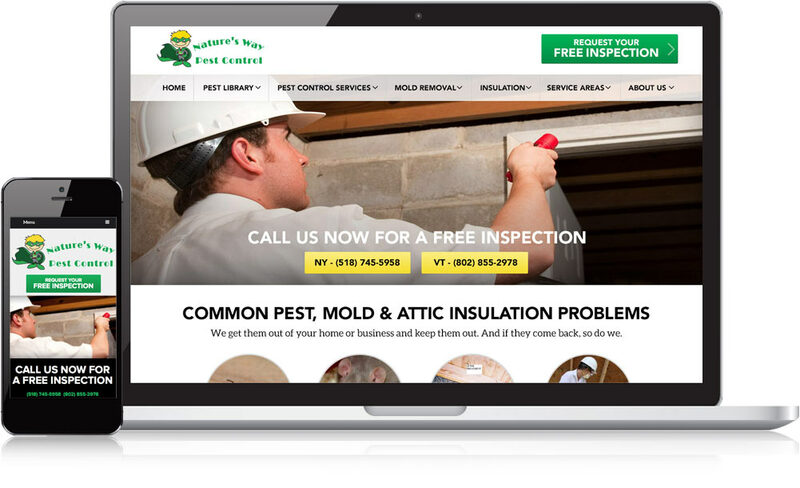 After researching SEO companies, Jason (Jay) Sankey hired Mannix Marketing to grow his company’s presence in the search engines, attract more inquiries for pest control and other services (such as mold remediation and attic insulation), and establish Nature’s Way as an authority throughout their local markets. There are a handful of nationally recognized companies in the pest control industry that try to dominate the search results by aggressively using SEO and PPC to promote their services. Local pest control companies like Nature’s Way (who lack an in-house marketing department or an annual six-figure marketing budget), however, require a more creative, targeted, and nimble marketing strategy to effectively compete against the Goliaths of this industry. Through an in-depth analysis of their website, competition, and target market, our SEO team scoped out the many opportunities surrounding Nature’s Way’s website and then built a detailed marketing strategy to help Jay and his team gradually outrank the competition and attract more inquiries from residents and businesses in the target service areas. Almost immediately after our site went live, we noticed a huge increase in leads- like a 50% jump or more. I also understand the value in having Lisa involved monthly in the SEO and she has always been awesome.